The list of starters is now available (follow this link.) There will be eighty couples competing on the various races during the week-end. 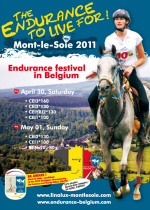 This is the first time that Mont Le Soie will be welcoming as many as participants. The weather forecast are favorable : there will be sunshine and clouds with normally no showers. It announces a very good level of participation, both on Saturday then Sunday. A dozen small Dutch, German five or six, eight French, a British armada will test the waters and the hilly eastern Belgium. ATRM, the French company for the timing of peak endurance races, will be there to manage the race and give us as usual flash rankings, timed to the second table redéparts, etc..
And last but not least, the commentator appointed Herve Guesdon we will enjoy his dynamism and his insightful comments. The configuration of the loops has not changed from previous years.